The Ariane 5 rocket placed both spacecraft into their designated Geosynchronous Transfer Orbits (GTO) 25 minutes after launch. 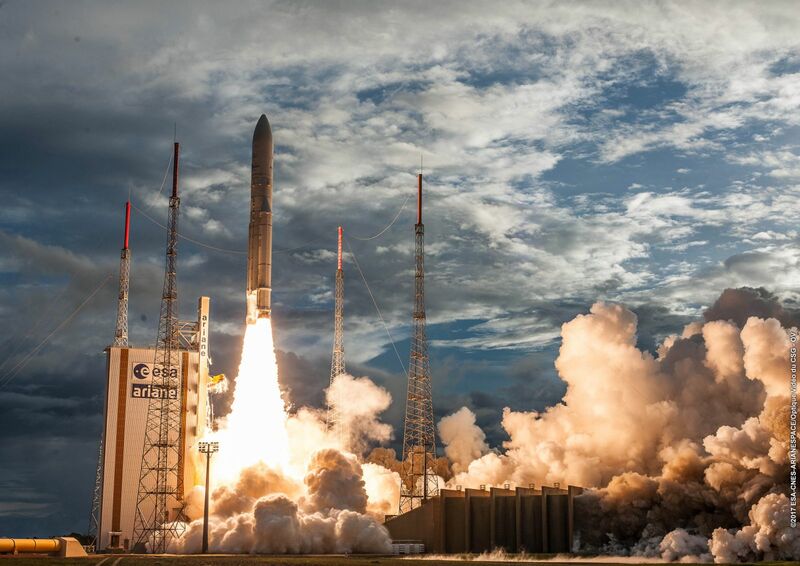 With another successful mission on the books, Arianespace’s history of providing launch services to an array of nations has increased. GSAT-11 is the ISRO’s heaviest satellite to date. The spacecraft is designed to provide improved communications for the Indian subcontinent including voice and data signals between the mainland and the surrounding islands. Positioned at 74 degrees East, the GSAT-11 carries 40 transponders in the Ka and Ku bands. The satellite is based on ISRO’s new I-6K bus, designed for advanced communications platforms. Due to the mass of the craft, the ISRO was not able to launch it on their own rocket. The satellite has a launch mass of 12,900 lbs (5,854 Kg), far exceeding the capabilities of the Geosynchronous Satellite Launch Vehicle (GSLV) Mk III which can ferry an estimated 8,820 lbs (4,000 Kg) to GTO. The satellite was originally scheduled to fly in May of 2018, but it was recalled back to India after a similar satellite (GSAT-6A) developed communications issues with controllers on the ground. GSAT-6A was declared a total loss and flight engineers decided that it would be best to verify that GSAT-11 did not suffer from similar issues. After extensive checkouts, GSAT-11 was cleared for flight and transported back to the production center in Guiana. Final integration of the satellite with the Ariane 5 occurred on Nov. 30. Along with GSAT-11, Arianespace launched the GEO-KOMPSAT-2A for KARI, its mission was different from that of its traveling companion. GEO-KOMPSAT-2A was built to monitor both terrestrial and space related weather for up to 10 years. Designed by KARI at its facility located in Daejeon, South Korea, this observation platform will be positioned at 128.2 degrees East. The spacecraft is the 68th Earth observation satellite launched by Arianespace and is the seventh spacecraft South Korea has entrusted to the Arianespace launch organization. Prior to this flight, Arianespace had placed 588 satellites into orbit. Of those 155 were for other space agencies for countries such as India, Japan, France, Italy, as well as the United States.